Today early morning around 0550 hours our car will pick you up from airport / hotel and drive to new Delhi railway station to board the shatabdi Express (Depart at 0615 hours) to Agra, beautifully situated on the banks of river Yamuna. It achieved prominence as the capital of the Mughal Emperors from 1526 to 1628, remains major tourist destination because of its many splendid Mughal-era monuments, most notably the Taj Mahal, Agra Fort & Fatehpur Sikri, all three are UNESCO World Heritage sites. We arrive Agra at 0815 Hours. Upon arrival our company representative will meet you at Agra railway station and will take you to the city tour. 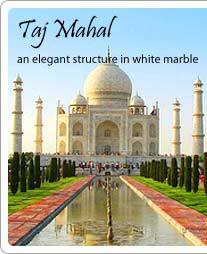 Here we will visit Taj Mahal, symbol of eternal love, which stands on the banks of River Yamuna. It was built by the 5th Mughal emperor, Shah Jehan in the year 1631 in memory of his wife, Mumtaz Mahal. It was completed in 22 years. Further we visit Agra Fort, taken over from the Lodhis by the Mughal Emperor Akbar in the late 16th century. The Fort can be more accurately described as a walled palatial city. It was built from red sandstone, often inlaid with white marble & intricate decorations. Rest of the day we will visit Local Market for Shopping. Later in the evening around 1930 Hrs. we will drive back to Agra Railway station to board the train(Expected Departure Time -2030 Hrs) to Delhi. On arrival Delhi (Expected Arrival time 2230 hrs.) our Car will pick you from railway station & drop you to the airport/ hotel. Tour Cost: To be advised.